Both P & S Models are ideally suited to residential homes as they have straight sides resulting in the maximum amount of livable space. Both can easily be tailored to your aesthetic requirements with custom end walls. These can be made of steel, hardy board or even finished with stucco or brick. It is also important to note that the buildings can be insulated and that a mezzanine-type second floor can be added to larger buildings over 30 feet in width. End walls can also be fitted with windows and the roof structure can easily be fitted with skylight panels for additional natural light. One stop shopping. 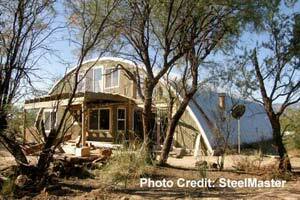 Quonset hut home kits contain everything you need to build your own home, except for the foundation. Quonset huts may be installed over an existing foundation using bolts or by forming a U shaped concrete channel as a footer. 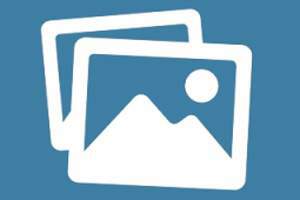 They may also be erected on top of concrete or wooden side walls. There is no need to pour a slab foundation. included in the building package are the main arch sections of the building, which are approximately 2 feet wide; all fastening screws, anchor bolts and end walls (if required). as mentioned previously, end walls can be custom made on-site to fit your specific requirements. Wide open space. 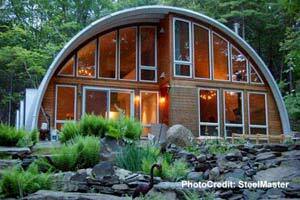 Quonset style houses have no interior structural supports, providing a clear-span interior for maximum usable space. The floor plan is unobstructed, allowing for maximum usable space without having to worry about poles and beams etc. Long life expectancy. Quonsets are made from galvanized steel that is rust and corrosion resistant. The structural integrity is extreme and designed to stand up against wind, snow and hail, most can even withstand hurricane force winds! Fire resistance. Metal Quonset buildings stand up well to fire, and can even contain an interior blaze and keep it from spreading. It takes a lot to permanently damage a Quonset; though blackened, many weather flames well enough to provide additional years of service. Convenience. Owners can install insulation, ventilation, air conditioning or heating, electricity and even partitions to make a comfortable, modern living space. Quonset residential buildings can be used as a sturdy, weather resistant alternative for home offices, guest accommodation or even hunting & ski cabins. Speed and ease of construction. 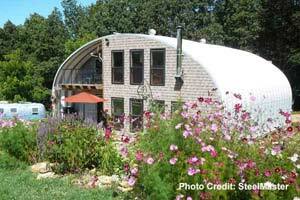 Four people can easily assemble a Quonset hut home in a matter of days; the tools required are fairly basic, and the prep work needed is not extensive. Once assembled, maintenance is minimal. Note: save on construction costs by erecting the building yourself. Buildings under 5,000 sq ft are suited to DIY construction. You will require lifting equipment such as a backhoe to lift the arches into place.